Round 6 is a curiously long stage. It's almost as if this stage was intended to be the final stage, but then four more were added to the game later on. This stage is approximately the equivalent of three stages, complete with three opportunities to find a horse, and two breaks in between before the boss shows up at the end of the third part. You begin walking along the bank of a lake to your left. You won't be attacked by regular Gunmen, but rather by Native American Gunmen, along with the occasional Archer every now and then. They appear to be slightly faster than regular Gunmen, but they are otherwise identical to their non-native counterparts. By the time the lake ends and you walk between the fort walls, you will discover a new item in the right most barrel: a cattle skull. Do not touch these; they drain your power-up collection by one for each category every time you pick one up. Beyond the wall is a giant boulder with two barrels beneath it. The right one contains a skull, but the left one contains a 10,000 bonus point dragonfly. Continue advancing and eventually spear throwers will arrive just as you reach another lake. Behind them will be a pack of Bombers to watch out for. The first barrel along the bank of the second lake contains a horse. The rest contain power-ups and skulls. Native Snipers will appear from the caves on the right. After you clear the lake and walk beyond another wall, you will begin to walk through a set of tee-pees. There are four barrels below the second tee-pee, and while the left most barrel contains a skull, the right most barrel hides a 20,000 bonus point cow. Be sure to clear away the sniper inside the tee-pee before you attempt to collect it. 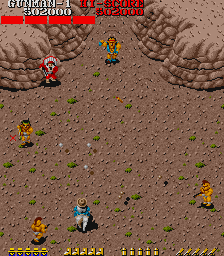 Bombers will greet you as you move through the next set of enclosures until finally the scrolling stops, and the boss appears on horseback. However, as much as you try to shoot him, he will not react and he will eventually depart, leaving you to deal with the enemies appearing from every direction until the scrolling resumes. You will go through another section of tee-pees until you reach a river that crosses the screen. The middle barrel against the lower left bank of the river contains a 10,000 bonus point dragonfly. Carefully remove the enemies on the bridge as you cross the river. The barrel on the far left contains boots and the barrel on the far right contains bullets. Next you must navigate around a series of hills, with natives that jump from the tops to the ground below and attack you. Meanwhile, Bombers litter the path with dynamite. In front of the last hill will be a barrel containing a second horse. Beyond that hill, are three barrels just before a bridge. The middle barrel contains the rare Yashichi which grants you an extra life. After you cross the bridge, you will see a lone barrel to the left. This barrel contains a 10,000 bonus point star. Just before a series of caves with ladders leading up and Snipers inside are three barrels, the right-most of which contains the enemy defeating POW symbol. As you pass through this area, you'll have to be mindful of Sniper fire coming from caves on both sides of you. The two barrels below the first wall on the right contain power-ups and the one barrel below the second wall on the left contains a 10,000 bonus point dragonfly. After that, you will wind your way through a couple more hills before the scrolling stops and the boss appears on horseback. Once again, you can't do anything to him besides watch as he runs away. The four barrels on the right all contain 1000 bonus point bottles and flasks. 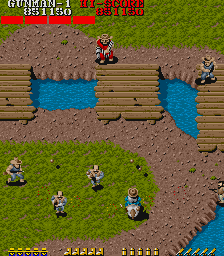 A steady stream of Gunmen and Riflemen will appear for a short duration until the screen begins scrolling again. Once the screen moves again, you will walk around a hill on the right. Behind the hill, to the right of the next bridge, are three barrels. The far right one contains a skull, but the middle one contains yet another Yashichi. As you cross the bridge, Hatchet Throwers will appear on the other side. Be very careful around them since you may not be familiar with the pattern of their attack right away. On the left side of the bank are four barrels, three of which contain a different power-up each. A variety of enemy types will attack you as you walk along the lake. The third-to-last barrel on the left contains a 10,000 bonus point star. Prepare to deal with Snipers on the right. The four barrels on the right contain 1000 bonus point bags except for the third, which contains a skull. Likewise, a skull is found in the right barrel against the left wall, but the left barrel contains the enemy-killing POW symbol. Archers try to stop you through the next section before the tee-pees. There are two barrels on below tee-pees on each side. Ignore the right and shoot the left, which will contain a 10,000 bonus point dragonfly and a third horse to ride on. More Hatcher Throwers and Bombers will attack you as you move through the tee-pees, most of which contain Snipers. Two barrels will appear near the middle, and the left one contains a skull (the right contains 1000 bonus points). Three barrels line up below the next wall, two of which contain skulls. After the wall, you will see four barrels. Three contain a different power-up each, but the second barrel contains a skull, so if you collect them all, it's a wash. Snipers appear on both sides, while the barrel to the right of the tee-pee contains a POW symbol. The screen will stop scrolling just short of two hills. Health: 4 bars. After taunting you twice, Wolf Chief jumps right into action, practically firing his Shot Gun the moment he lands on the screen. His shot gun fires three bullets that fan out as they travel, making them relatively easy to squeeze between if you remain low enough. He is no different from other bosses; he is only vulnerable when his feet are on the ground. In general, the best strategy is to stay low and try to attack him from the side. Remain on the opposite side of the screen from him as much as possible, crossing over only when he does, or if you are in immediate danger from regular enemies on the same side. You have a slightly better chance of hitting him from the side than you do straight on. 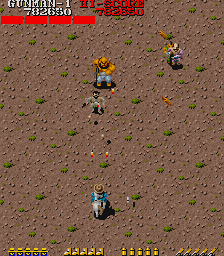 This battle is slightly tougher than others because all the regular enemies are the Native American gunners, archers, and spear-throwers, who are harder than the standard outlaws in all other boss fights, so be aware of their different behaviors and firing abilities. Knock Wolf Chief down four times and you will finally advance to the next round, $80,000 richer. This round greets you with a row of three Riflemen and two Gunmen and from there it only gets worse. Back-stabbers will continuously jump down the cliffs in an attempt to intercept you. Three different power-ups await you in the first four barrels. The next three only have two bonus point bags. You will then enter a long open stretch. It's tempting to run up and intercept the enemies that appear near the top, but be on the lookout for more enemies that appear from the sides and try to ambush you. In the four diagonal line of barrels, the outside two contain 1000 bonus point bottles, the second contains a skull, and the third contains a horse. The next three barrels contain boots, bullets, and a skull in the top right barrel. Watch out for more Back-stabbers jumping down as you move through the area. Many of the barrels throughout this section contain 1000 bonus point items or skulls. However, when cliffs appear on either side, you will see two barrels in a row. The first contains a skull, but the second contains a 10,000 bonus point dragonfly. Beyond that is a lone barrel to the left which contains a POW symbol. Power-ups and skulls are found in the remaining barrels leading up to the boss as you encounter more Bombers and Riflemen before the screen stops scrolling. Health: 4 bars. Goldsmith is one of the more annoying bosses to fight, due to his tendency to constantly roll on the floor in order to avoid getting shot. He attacks with two rifles that he shoots at a slight angle to one another so that the bullets spread out as they travel. Because of his insistence on rolling around so much, you'll have to spend more time dealing with the regular enemies that are also attacking until you see him stand up and start firing at you. Then focus your attack on him while avoiding getting shot, until you knock him back down and he continues rolling. This stage sees Billy walking primarily through an open field with a dirt trail blazed through it. 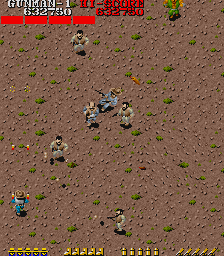 You'll find one of each power-up in the first four barrels while Gunmen and Riflemen appear to stop you. The openness of the field may tempt you to charge forward, but stay behind to prevent enemies from getting behind you and shooting you in the back. A bull corral will appear on the left. Inside the four barrels in front are three 1000 bonus point items and a skull. The bulls in the corral can be shot, but they can't harm you, as they are contained by the fences. The barrel that appear above the very top of the corral contains a horse. One of each power-up can be found in the three barrels along the bank of the pond on the right. Above the pond, three bulls will be standing around, waiting to trample you if you shoot at them. Gunmen will continue to appear through an empty stretch. When you begin to see single barrels positioned in front of roots, the first and last barrel have skulls, but the middle one contains a POW symbol. The three barrels at the bank of the next pond each contain a different power-up, but watch out for the Bombers in the area, littering the ground with dynamite. As you pass the pond, you will see three barrels on the left. The middle one contains a 10,000 bonus point star. Then the screen will stop scrolling when you appear to reach a fort entrance. Also, be warned that gray riflemen for the boss fight might spawn early, before the screen stops scrolling, and as such they will be much lower to the bottom of the screen than they should be. Health: 6 bars. For being the eighth round boss, Los Pubro is oddly easy to defeat if you go on the offensive. He walks around, never jumping or rolling around, and he has very little invincibility time after taking a hit. He has 6 bars of health, but a constant stream of fire can take away several life bars quickly. He fires a pair of pistols at a fairly regular rate, but nothing so bad that you can't avoid it and shoot at him from the side. There are two barrels at the top of the screen. The right barrel only has a 1000 point bonus item, but the left one contains a POW symbol. Don't be in such a rush to collect it, as you may put yourself in a worse position having to come back down in order to continue fighting. Only grab it if it is advantageous to do so. Los Pubro should go down fairly quickly. This round may remind you a bit of the first stage, but the town looks deserted and falling apart. Enemies will pour on to the screen from every direction, so you'll simply have to keep your guard up. The first three barrels that you encounter on the left contain a different power-up. You'll have to watch out for the array of Snipers that appear in the windows to shoot at you. Bombers will frequently appear along the top. Many of the barrels contain 1000 point items. Eventually a lone barrel will contain a skull. However, the next barrel after that will have a 10,000 bonus point dragonfly, and the barrel after that will contain a horse. Many Back-stabbers will jump off the roofs of the buildings on either side of you until buildings only appear on the right, complete with the requisite Snipers. When you see a lone barrel off to the left, the barrel just before that on the right contains a 10,000 bonus point star. That lone barrel on the left actually contains a second horse in case you missed or lost the first one. The next barrel on the right is empty, but the one above it contains an extra life-granting Yashichi. Focus on dodging all of the bullets that fly across the screen. The second to last barrel (which appears around the time the boss music starts to play) has a skull, but the last barrel above it has a POW symbol. The screen will stop scrolling a short distance after the last building disappears. Health: 4 bars. Fat Man is considerably harder than Los Pubro. Like Los Pubro, he doesn't jump around and he fires his weapon constantly, but Fat Man's machine gun is much more lethal, and has a better chance of hitting you. The bullets are fast and constant. You're much safer attacking him from the side, and somewhat further up the screen than in front of him. A good tactic is to shoot to the side of him, and slowly scoot away, such that he keeps walking into your bullets but you move out of the way of his whenever he gets into range to target you. Of course, this leaves you vulnerable to attack from enemies standing behind you, but it's a chance you're going to have to take, as even completely powered up, you stand little chance against Fat Man from the front. This round will probably remind you of the third stage, with the river that cuts through the screen, and the bridges that span it. The first set of barrels contain power-ups, but it may be a bit difficult to get all three. The next set of barrels contain a skull and some bonus point items. A third set of barrels appear next, with nothing in the barrels on the right bank, but a 10,000 bonus point dragonfly in the left barrel. Be careful of the Gunmen that show up on the left side with little room to maneuver. 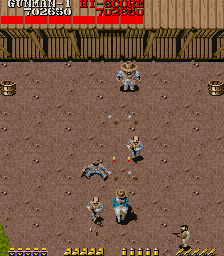 A horse will appear from the barrel that sits alone on the far right of the screen. The next three barrels, arranged below and above the bridge that you must use if you are still on the right, contain power-ups. Another two barrels appear below and above a short bridge, the lower of which has a 1000 bonus point bag, but the higher one contains a POW symbol. Remember to stay low as you continue your way along the river. The barrels that you encounter leading up to the vertical bridge crossing don't contain much of interest, except for a bullet power-up found in a lone barrel along the left bank. The boss music will start to play as you begin to cross the vertical bridge. 1000 bonus point items are in the barrel along the right side of the bridge. Along the left side, the first barrel is a skull, but the second barrel is a 20,000 bonus point cow. A crowd of Bombers greet you on the opposite side of the bridge. The three barrels on the left contain two power-ups and a skull. At this time, you will see a small stream with three bridges going across. The first of the Wingates will arrive. Health: 4 bars. The young two Wingate siblings will appear on the right and left bridges of the screen. They will flank you on either side with rifles. They actually have no health bars, so shooting them will not reduce the boss health meter at the top of the screen. Whether or not to shoot them is a decision you have to make. Removing them from the screen does not necessarily make the boss any easier, because they will be replaced with more regular enemies. In other words, leaving them on the screen can cut down on how many other enemies appear. Eventually, the eldest Wingate will appear at the top of the screen, looking much larger and wielding a much more menacing machine gun. His gun fires bullets which fan out at a wide angle. They also move quite fast, making it difficult to determine a safe place to stand in order to avoid them. Your best bet is to remain as low as possible, while still being able to shoot at the lead Wingate. Of course, you may find it easier to shoot him from the side, but that will necessitate removing at least one of the younger brothers first. Once you hit the eldest brother, he will drop to the floor and crawl around while he shoots at you, during which he is invulnerable from getting shot. Back off and wait for him to stand before knocking him down again. If you knock him down four times, victory will be yours and you will be treated to the end of the game. Congratulations. This page was last edited on 9 January 2016, at 12:34.